​"These poems disturb the peace with a loudness hard won from centuries of humility"
​Generations of disapproval leave their mark - and install beliefs, mindsets and habits so rigid that they are hard to break. "From Sappho's alchemy of silence to Penelope Shuttle's wild, unrepentant roses of Katherine of Aragon, these poems are a cabal, a coven, a community, a choir of women's voices at once brave, painful and subtle. Together, they stand their ground and disturb the peace with a loudness hard won from centuries of humility. If Sarah Guppy could have raised her famous suspension bridge on the tensile strength of words, it would look something like this. ​"
Sarah Guppy also designed a samovar that made tea and cooked eggs; a method for preventing barnacles from clinging to a ship’s hull... and an exercise bed for women to use at home as it was considered inappropriate for women to exercise in public. There are no statues of Sarah Guppy, no plaques that recount her inventions. In our culture, it has often been deemed acceptable for women and their achievements to be buried, covered over, dismissed. Sarah Guppy herself once said: it is unpleasant to speak of oneself – it may seem boastful particularly in a woman. Mary Beard’s fantastic book, Women & Power, A Manifesto, traces the history of women being discouraged from speaking in public spaces all the way back to Homer. Speaking is a gendered issue, and we wanted to ask if this was still the case. Are women still finding that it’s unpleasant to speak of themselves? Are we still self-censoring for fear of being judged as boastful? How much has really changed in a hundred years? It became our dream to put together an anthology of poems by a wide range of women poets responding to these questions. 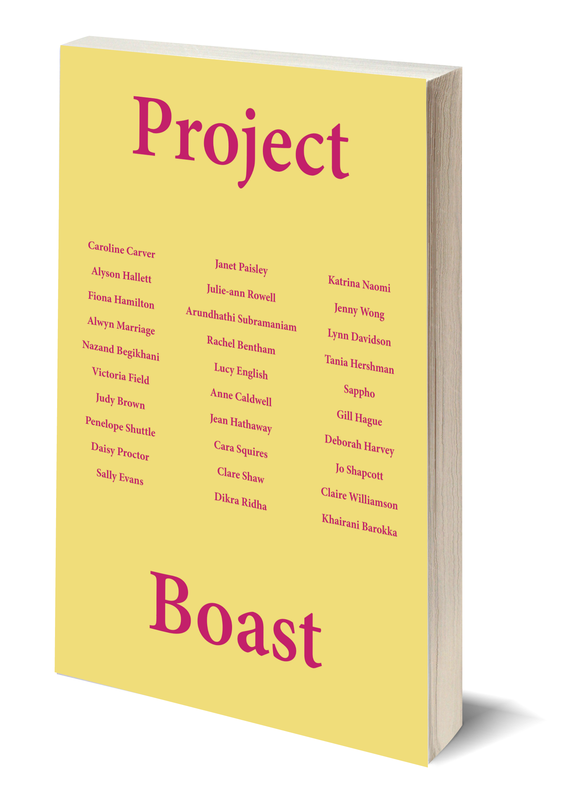 We wanted to create an anthology whose platform is generous and far-reaching, a space where poets could approach the idea of speaking in whatever way appealed to them. Thus Project Boast was born... Some poets remarked how hard it was to speak of themselves. Some let rip with a formidable self. Some take an inventive approach, while some speak through their poems with a direct, quiet authority. We wanted to provoke all these voices, to seek them out and encourage them. We wanted to suggest that confidence can come from speaking out. We wanted to update Sarah Guppy’s assertion to: It is good for women to speak of themselves - it is life-changing and vital for a healthy society and culture. If we can do this, we might see statues and plaques of all the forgotten women starting to appear in our cities. We might begin to address the things that need to be addressed and take another step along the long, long road to equality.